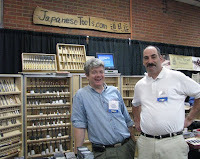 According to Jim Blauvelt and Harrelson Stanley, Japanese saws just make sense. Since they are used on the pull stroke, they tend to stay straight in the cut, as opposed to Western saws, which are used on the push stroke and can sometimes bind in the cut. 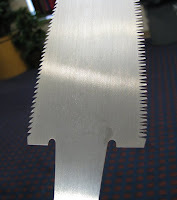 Because of this, Western saw blades are thicker than Japanese blades in order to accomodate the resistance. No vise is used when cutting with a Japanese saw. Huh?? What's a workbench without a vise? Less expensive, for one thing. 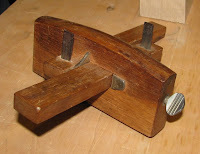 Instead of employing a vise, you cut down toward the benchtop at a 60º angle. 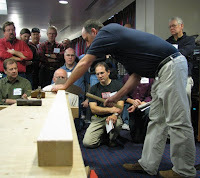 I was intrigued with the planing stop: a sliding dovetail (second to last photo). Jim and Harrelson recommend using the most aggressive saw possible for a given task. Larger Japanese saws, typically used for carpentry, are as accurate as but cut faster than smaller ones, which are typically used for joinery. 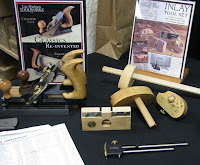 There is huge variety in the quality of saws on the market, the best having been made within the last 10-15 years (I don't think they were including saws that were and are handmade by masters, but rather machine-manufactured saws in the 20th & 21st centuries). Saws in the $40-$50 range with disposable blades are a good choice. Avoid imp ulse-hardened teeth, where only the surface of the teeth are hardened. These teeth appear bluish in color. Jim & Harrelson said "you can feel the steel stretching as you use [these saws]." 1) Shorter teeth with steeper bevels work best for hardwood. 2) Ry oba (meaning "both") is a 2-sided saw. One side is crosscut and the other is rip. 3) Keep your saw oiled every day. 4) Dozuki is a backsaw and is available in both rip and crosscut. 5) Azehiki (5th photo) is a short- bladed saw used for starting a cut in the middle of a board and for sawing the sides of a groove. The last photo is Jim's marking gauge. I couldn't resist. I bought a dozuki about 14 years ago and loved it until I put a kink in the blade (about 2 months after I bought it). It worked very well, but you have to be gentle and sensitive with Japanese saws. Maybe play a Barry Manilow album while you're using them. New Tools: Gadgets or Godsends? 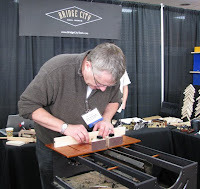 The marketplace at the WIA conference was bustling with would-be tool buyers looking for the latest offerings from manufacturers. 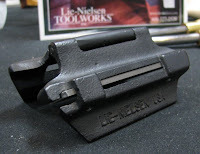 Lie-Nielsen devoted a corner of its booth to its new line of innovations: saw jointing jig, chamfer plane, tongue & groove plane, inlay tools, corner chisels, small hammer, fishtail chisels, burnisher, and a tool that cuts shallow mortises, Quaker locks, and the like after you have assembled your workpiece. I was especially in terested in the saw jointing jig, which hinges open so you can slide a file in place. The wings of the jig fold over top your saw blade so that the file rests on top of the teeth. You slide the jig along the teeth, thereby jointing them to the same height. In one of the conference seminars—Modern Tools: Tolerances & Myths—which was conducted in panel format with Robin Lee (RL), John Economaki (JE), Konrad Sauer (KS), and Thomas Lie-Nielsen (L-N), a lively discussion ensued after an audience member asked if new designs were merely gadgetry. "Do we really need all these tools?" he asked. He sited one product, the Jointmaker Pro, invented by John Economaki, and inferred that it might be unnecessary and overpriced. KS—Experiments are important. Some are valid, some are not, but inspiration keeps the industry moving forward. RL—If you enjoy it, buy it. JE—One thing you might not know about the Jointmaker is how many people it has helped: schools for the blind, people who have never been able to saw a straight line, people with one arm, and people with Parkinson's disease. You can't put a price on that. RL—We offer a right angle magnetic guide for people with hand tremors. JE—You don't need a lot of tools. Buy something because it speeds up woodworking. Gadgets might help you if you have time constraints. Above all, learn to make meaningful projects. Treat wood like it's $500 bf. That piece has to have a voice by itself when you're gone . Another question from the audience: What are you going to change/what have you learned? JE—We create new products based on my whims. L-N—We're going to offer more instructional DVDs. RL—We're slowly going to expand technologies with new lines of tools. We are just now offering our first handsaw. Many suppliers are disappearing. We have witnessed the closure of over 2,000 of our vendors/suppliers, which makes it difficult for us. Gadgets or godsends? You decide. But I'll leave you with this insight from Adam Cherubini: "We need to support the modern tool makers. You can't grow a movement with antique tools."